Abortion rates in the United States are at their lowest levels since the government started tracking them in the 1970s. A report issued Friday by the Centers for Disease Control’s National Center for Health Statistics said that in 2012, the year with the most recent data, there was a 35 percent drop in abortions during the past two decades 0r about 13 abortions for every 1,000 women. “Abortion has been on a nearly steady decline since the rate peaked in 1980,” said Sally Curtin, a CDC statistician, to CBS News. In 2012, 699,202 legal induced abortions were outlined to the CDC for women between 15 and 45, the report said. More than 90 percent of abortion took place during early stages of gestation, while women in their 20s accounted for the majority of abortions. In 1990, there were 27.4 abortions per 1,000 women and 1.6 million abortions overall. By 2010 that number dropped to 16.7 abortion per 1,000 women or 1.1 million abortions, according to the report. 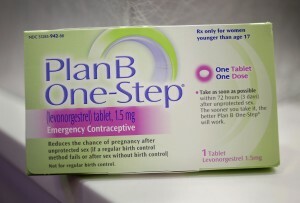 The CDC said the decline in abortions can partly be attributed an increased use of obtain birth control. The pregnancy rate has also fallen by 10 percent since 1976, while teen pregnancies also dropped by 67 percent. Kathryn Kost, a researcher at the Guttmacher Institute who co-authored the report, told CBS News that many people are deciding to start families later and that both men and women are more effectively using contraception. 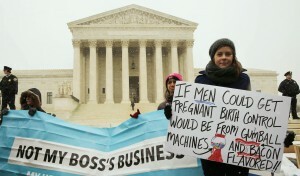 Left: A protester holds a sign at the steps of the Supreme Court last year as arguments began to challenge the Affordable Care Act's requirement that employers provide coverage for contraception as part of an employee's health care. Photos by Larry Downing/Reuters.